I have not been buying many records lately. I’ve been trying to make an exhaustive list of street artist Banksy’s record cover art. I usually do this sort of research by checking what is on offer on Ebay. Yesterday was bingo! I bought a promo copy of Benjamin Zephaniah’s ‘Naked’ CD which has several Banksy images in the booklet. And another vendor had seven Banksy covers for sale, including the elusive Dirty Funkers’ “Let’s Get Dirty” single with Banksy’s (in)famous portrait of Kate Moss done in a sort of Andy Warhol style. There are two pressings of this 12″ single; the rare first pressing had the portrait in different colours on the cover’s front and rear with no title. The, not so rare, second pressing had the same images but with a title band across Kate’s eyes making her unidentifiable. This vendor was offering both covers on a ‘Buy it Now’ basis, together with a couple of other 12″s and three CD compilations with classic Banksy images. I had managed to sell a few duplicate records and had some extra funds, so I fell for temptation and bought the lot! I think (hope?) the rarer Banksy covers will appreciate in value – particularly the Kate Moss cover. 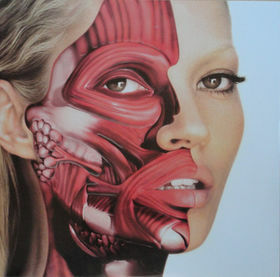 Speaking of which, Damien Hirst put out a limited edition 12″ single in 2009 using the cover image of a dissected Kate Moss that he had used on the cover of TAR magazine. This was a one-sided white vinyl record issued in 666 copies with what sounds like Kate Moss talking on the telephone for about 30 seconds and then some noise before Hirst expounds on the subject of it being okay for artists to earn money. I’m not sure of the artistic quality of this cover, but it fits with Damien Hirst’s interest in death. Anyway, now I’ve added a lot more Banksy covers to my collection.